With all the seafood I eat these days, it’s easier to meet friends for dinner at a seafood restaurant than at places that serve other types of cuisine that I largely can’t eat because it contains too much, salt, fat and sugar. 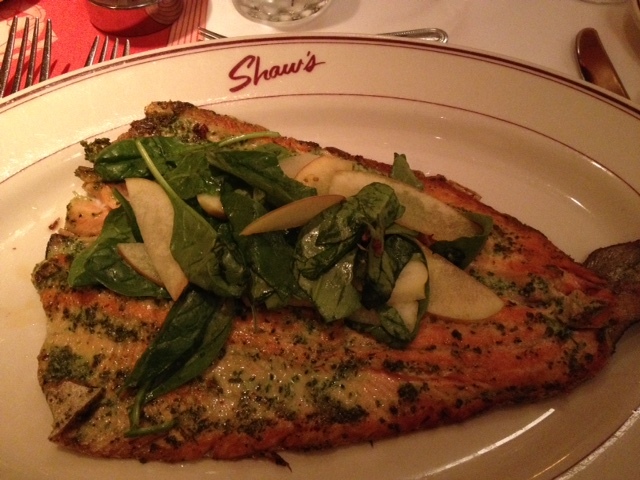 Recently, we met friends for dinner at Shaw’s Crab House, a long-time Chicago seafood place. I often frequented its downtown location when it was a new, hot spot to be. It now has a suburban outlet in Schaumburg, Il., near the massive Woodfield Mall, and we’ve enjoyed eating there in the past as well. My delicious rainbow trout at Shaw’s in Schaumburg. Shaw’s did not disappoint on our latest visit, although it had too many seafood options gunked up with crusts and cheese and other things I can’t eat anymore, as far as I was concerned. I started with a half-dozen assorted oysters, both East and West Coast, passing up the usually seafood sauce on them to just enjoy their flavor straight. East Coast oysters are fairly salty, so this was a splurge dish for me, salt-wise. For my main course, I had a wonderful rainbow trout with apples and some greens. It normally comes with bacon butter as well, I asked that be left out to avoid the salt and fat in that. The fish was wonderfully flavorful all on its own. Most desserts are out for me these days because of salt and fat concerns, but Shaw’s was offering black raspberry sorbet that night, which I ordered and enjoyed immensely. Shaw’s is pricey, but worth it in my estimation, I was glad we visited it and look forward to going again.